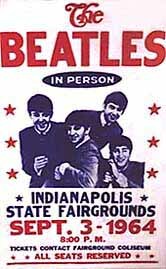 ABOUT THIS PRESS CONFERENCE: The Beatles traveled from Philadelphia to Indianapolis, playing two shows on September 3rd at the Indiana State Fairgrounds. After a fun and entertaining chat with the press, and a quick meet-and-greet with a group of lucky locals, the Beatles took to the stage. According to motor racing writer Bob Jennings who was one of the teenagers in attendence that day: "There was an afternoon show in the fairgrounds Coliseum before a packed house of something like 10,000 screaming fans. Ticket demand was so hot, an evening show was hastily scheduled in front of the grandstand on the one mile dirt race track because the Coliseum was already booked for another State Fair event. I was able to get tickets to the evening show... a couple hundred yards from the stage. There was an electricity that's hard to describe... about the only thing I can compare it to is the start of the Indianapolis 500." Ringo Starr would later remember in his 1982 radio program 'Ringo's Yellow Submarine,' "A fond memory was in Indianapolis. When you're touring you can't sleep normal and you don't eat. I think that's what drives us all crazy when we're touring. You don't know where your head is after a long tour. So I was wandering around the hotel 'round about 4 one morning in Indianapolis, and I met these two policeman who had a police car outside. So I said, 'Ahh, just nothing to do and I can't sleep.' And they said, 'Well, let's go for a ride.' So, they let me drive the car which was great. Then we went screaming all over the city and it got so crazy that we were being chased by another cop car. (laughs) We had to pull into this alley and turn the lights off and all hide in this police car -- me and two big cops are all hiding in a police car in Indianapolis. And this other cop car goes past us... and then the guys say 'Well, we got out of that so what else are we gonna do?' But it was fun... in a police car hiding from the police. I think they thought someone just stole it. (laughs) Probably my driving on the wrong side of the road." Following their two performances that day in Indianapolis, the Beatles departed for Milwaukee Wisconsin, the next stop along their franticly-paced 1964 North American Tour. Q: "Where do you gentlemen stand as far as the draft is concerned in England?" RINGO: "It comes from that door over there." JOHN: "Oh, you mean the Army. We all miss it. And if we didn't, we'd all hide in the south of Ireland." Q: "How closely was your script of the movie, 'A Hard Day's Night' scripted? How much of it did you fellas ad-lib or wing?" JOHN: "Most of it was script. You can tell the script bits. They're all sort of semi-Irish/Welsh things. Most of it was script. Alot was ad-libbed." Q: "I'd like to direct this question to John and Paul. Out of all the compositions that you've written, which do you..."
JOHN: (anticipating the question) "We don't know." JOHN: "Which is your favorite." Q: "Which is the best?" JOHN: "'Land Of Hope And Glory' was one of my favorites." Q: "Who decides who's going to sing the lead of a particular song you may do?" JOHN: "It depends on alot of things. If I write.... If we write 'em together, he sings higher than me so basically I normally sing lead and he sings harmony. If I can't make it he sings on-tone." Q: "Do you write alot of the songs in the hotel room?" Q: "It's rumored that you have written some things for symphony orchestras." RINGO: "I don't even write letters." Q: "As you're confined to your room all day, what do you do?" GEORGE: "Oh! Tennis and waterpolo." RINGO: "We just sit 'round." PAUL: "Sit 'round, read, tell jokes, play Monopoly." JOHN: "Hide from the security. Things like that." Q: "Does it get boring?" Q: "If you could just walk down the street without anyone recognizing you, what would you like to do?" JOHN: "Well, we used to do that with no money in our pockets, so there's no point in it. It's a dead loss." Q: "Fellas, what's your opinion of the Animals, the group with the big song?" PAUL: "Very good group. They're nice fellas, too." Q: "Have you seen them before? Have you seen them perform?" PAUL: "And they're nice fellas from Newcastle, you know." Q: "What's your favorite... Goldwater or Dowdy?" JOHN: "God save the queens." Q: "John? Have you written a book?" 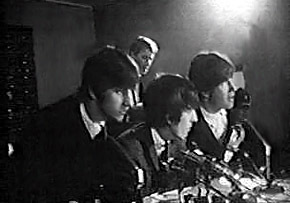 RINGO: (chuckling about the reporter asking the question) "Who IS she?" Q: "What is it called?" JOHN: (pauses) "...Uhh, 'In His Own Write,' you see." PAUL: "So he's gotta be deep. Something deep coming up any minute." JOHN: (half-jokingly) "You should buy it. That's the least you can do after saying that." Q: (snide tone) "Why don't you send me an autographed copy?" JOHN: "I can't be bothered." Q: "Do you fellas have a favorite American singing group?" JOHN: "We've got so many." GEORGE: "The Detroit sound. All of the people from Detroit we like." JOHN: "Nearly all of them." Q: "What do you think of our American group called the Beach Boys?" PAUL: "I like them very much, yeah. Very good harmonies." JOHN: "We've never seen any of them Live, but they all make good records." Q: "Ringo, what's your favorite color?" Q: "They say all sorts of stuff. What is it really?" JOHN: (to Ringo) "What do they say about you?" 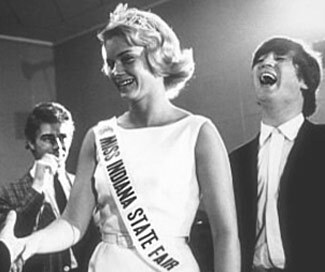 RINGO: "I don't know what do they say about me?" GEORGE: "What is it, Ringo??" RINGO: "Black, I'll say! What's yours?" Q: "What do you do with all the presents you get?" RINGO: "We ship most off them back to England." PAUL: "Well, any of the ones that we can't keep, or the ones that are impractical, like a fifty-foot cake that we could never eat." JOHN: "We've never had a fifty-foot cake!!" PAUL: "...a three-foot cake, you know. We give it to a charity or hospital or something." Q: "Paul, what was your reaction to the movie (A Hard Day's Night) after you had seen it yourself?" PAUL: "Umm, I don't know, you know. With us being in it, I just watched us all the time. So the first time I just didn't think anything. But after a bit I just thought we weren't very good, but that the director was very good. I think he's a very good director, but we weren't much good." Q: "Do you think you will ever be invited behind the Iron Curtain?" JOHN: "If they've got enough Rubles, or whatever they've got." Q: "I understand they do not have an income tax." JOHN: "Well, they've got no money, either."